The whole dinner platter in this case is more convenient because I had some boiled potatoes in the fridge. You see I wont complaint about these potatoes as I lugged them back from Dhanachuli. I am working at Te Aroha to pep up their entire menu and love those potatoes growing in the step fields around the property. This time I just bought a large bagful and lugged back home. Now I can have potatoes everyday. At least a couple of wedges do slip in here and there and I am loving it. Pan grilling feels convenient sometimes when smaller amount of food is to be cooked and I can slide in the vegetables in the free space while the chicken or fish is grilling in the cast iron pan or skillet. In summertime it also heats up the kitchen lesser than the oven. To grill the whole chicken legs I slash the flesh and rub salt and pepper into the pieces. Sometimes I add lime juice to this rub but this time I did not do it as there would be some tartness into the mushroom sauce as well. The chicken legs are rested for about an hour and then placed into a hot griddle along with 1 tbsp butter. The chicken cooks on low flame, the griddle covered so the juices of the chicken help cook the flesh. Chicken is grilled both sides till golden brown and crisp. I slide in the potato wedges and julienne vegetables in the same pan during the last 10 minutes of cooking. 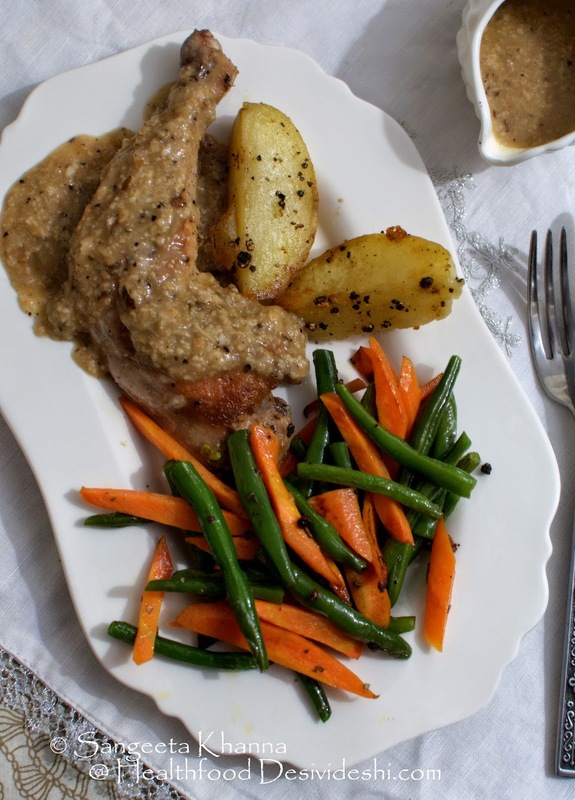 The star of this recipe is mushroom sauce that peps up the meal by a few notches. To make the mushroom brown sauce I have replaced white flour with powdered oatmeal. Taste wise I feel it made very little difference. Heat the oil and tip in the chopped onions and fry till they turn pink. Add the chopped carrots and salt and fry the vegetables till both turn brownish. Now add the chopped mushrooms and stir fry till the mushrooms wilt and the whole vegetable mix reduces in volume, becoming brown and caramelized. Take off the stove and add the thyme and black pepper while the mixture is still hot. Transfer the cooked vegetables to a blender jar, decanting some of the cooking oil into the pan. Add Worcestershire sauce to the blender too. Let the mixture cool down while you tip in the oatmeal into the remaining oil and cook while stirring it. Add half a cup of chicken stock and cook the roasted oatmeal for 2 minutes. Transfer the cooked oatmeal sauce to the blender and let the contents cool down before blending it all into a smooth sauce. Reheat, dilute with more stock if required and serve as desired. 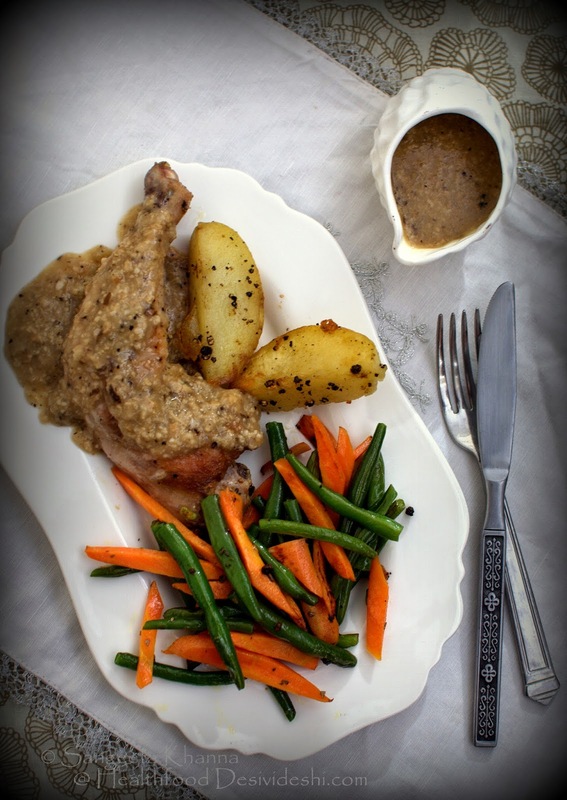 Poured over plain grilled chicken or chicken steak this brown sauce tastes really good. Sometimes I add bits of bacon while frying the onion to add more depth into the brown sauce. This kind of a meal is a satisfying nourishing tasty way to health. I used broccoli or cauliflowers too many a times in this mix of vegetables but whatever is in the fridge works well most of the times. Wilted spinach in winters is my fave accompaniment to such a meal. 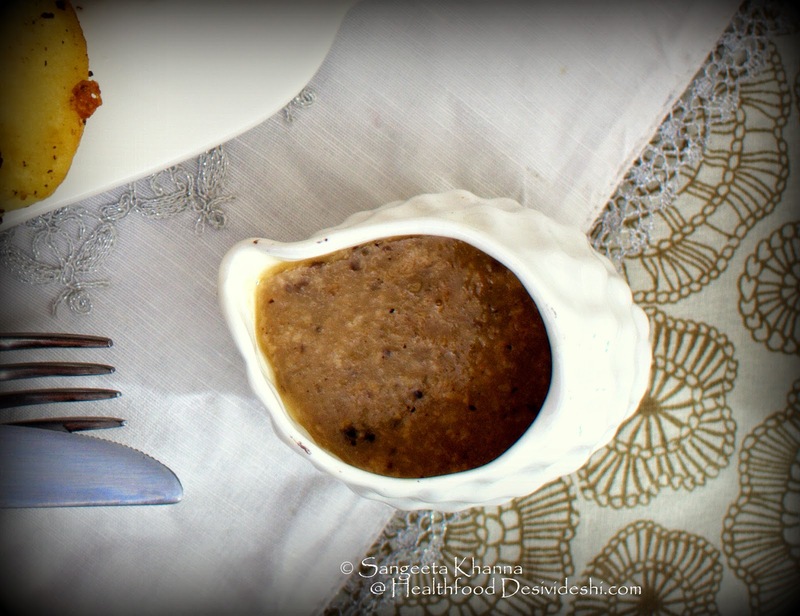 To make this mushroom brown sauce vegetarian, do not add any bacon or chicken stock. Use plain water or milk to dilute the sauce. The vegetarian mushroom based brown sauce can be used over paneer steaks and tofu steaks and tastes great.